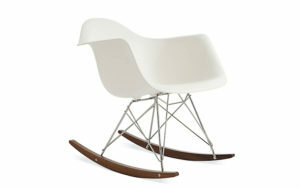 The Eames Rocking Chair (RAR rocker) is a gorgeous and enduring icon of modern furniture design. It is a must have in any mid century modern interior. Originally this Eames Rocking chair was designed using fiberglass but nowadays polypropylene is used, which gives more comfort and strength. The chair has chrome plated legs and stained maple ski feet to give maximum rockability. This, the classic Eames rocker is undoubtedly the most inspirational and stylish homes of the rich and famous. Whether your living space is ultra modern or classically traditional you will find this little gem fits in perfectly and adds a refined touch to any room. The innovative and courageous Charles and Ray Eames took the liberty of using fiberglass in furniture and in 1948 they first made their very famous Eames side chairs with wooden legs and fiberglass shell. The Eames side chair and Eames dining side chairs are comfortable yet elegant and easy in use. 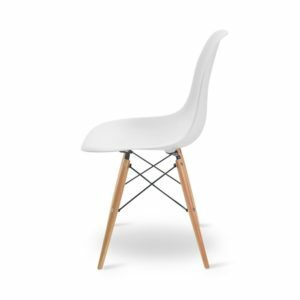 DSW (Dining Side Shell Wood) is a version of the Eames Plastic Side Chair with a wooden base. The Eames Aluminum Group series was designed in 1958. A private residence project of J. Irwin Miller, founder of Cummins Engines led the way through. An outdoor chair was what they desired and asked Charles and Ray Eames to design that for them. The Eames’s constructed their chairs with cast aluminum and a seat frame meant to support a stretched synthetic mesh. Since the start of development this chair became a staple as a mid-century modern classic. 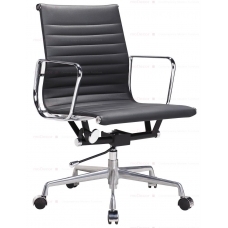 The aluminum Group Style Management office chair is set on a five-point base; these chairs sit on tubular steel columns and revolve for easy entry and exit. Charles and Ray Eames created more than a “look” with their bent plywood chairs or molded fiberglass seating. They had ideas about making a better world, one in which things were designed to fulfill the practical needs of ordinary people and bring greater ease and pleasure to our lives. 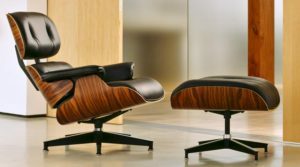 The Eames Lounge Chair Wood (LCW) and Eames Molded Plywood Lounge Chair (DCW) has been referred to as the “most famous chairs of the century,” with a low-slung form that relates directly to the human body and holds no secrets as to how it succeeds technically. Charles and Ray Eames are among the most important American designers. They are best known for their groundbreaking contributions to furniture designing. They combined the comfort and style in their designs, which led them among the top rated designers in all fields i.e. from the relaxing loungers to the elegant office chairs. Since the starts of Eames furniture designing career, Eames Chairs had always been the most favorite pieces in the lounges and rooms. 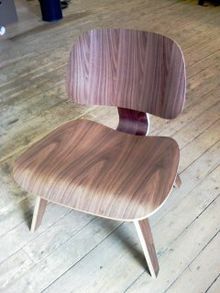 Eames chairs has got the touch of great elegance with modernized designs and different freshly experimented materials. The chairs had frequently been used by many well known people of the time including famous Hollywood directors. Charles and Ray Eames spent many years experimenting with new processes for optimizing the way three-dimensionally molded plywood fits the contours of the body. The LCW designed chair for a comfortable body posture is among the best possible options they developed. Eames Lounge chair is a sign of luxury and style with exceptional quality of comfort. It lives in museums and art institutes, in stylish interiors everywhere and as a tattoo on a devotee’s arm. A subject of classical documentaries and books, Eames lounge chair has played its vital role among the top ranked furniture icons. The Eames Lounge Chair: instantly recognizable luxury furniture. 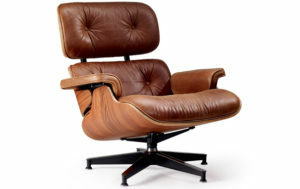 The Eames lounge chair and ottoman had been the subject of documentaries and books, part of the permanent collections of major art museums. The Eames lounger provides both sophisticated style and luxurious comfort in one’s home.